1= front man who has dropped in/wide, ie 4-3-2-1 2= mid 3 3= full back 4= strikers 5= mid 3 who will look to get frwd to pick up 2nd ball from cross. 6= mid 3 looking to give full back an option but not to get too close to striker. 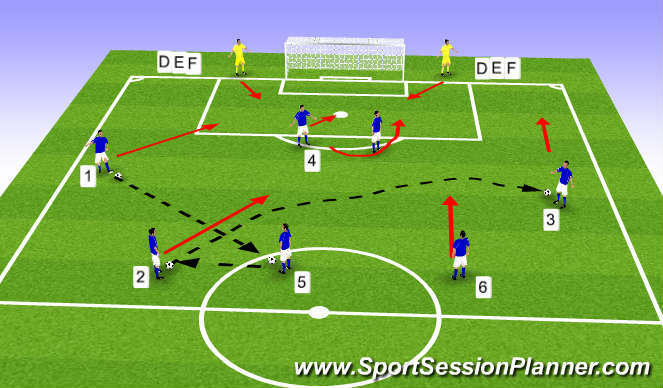 1 passes to 2, shapes up and switches play to 3 (full back in a 4-3-3) takes it down the line and crosses (low & hard or hi) option 2 can be play an early cross, if doing so, must communicate to strikers. Decision can also be determined by strikers hand movement. Note: Defenders come into play on 3's touch. Point out back three would shuffle across with RCB and 2 looking to provide cover for RFB. 1 plays into 5 who lays off to 2 who creates the switch pass to 3 allowing him to continue similar priciples as phase one. Encourage Strikers to arch runs & take Defenders away before going. 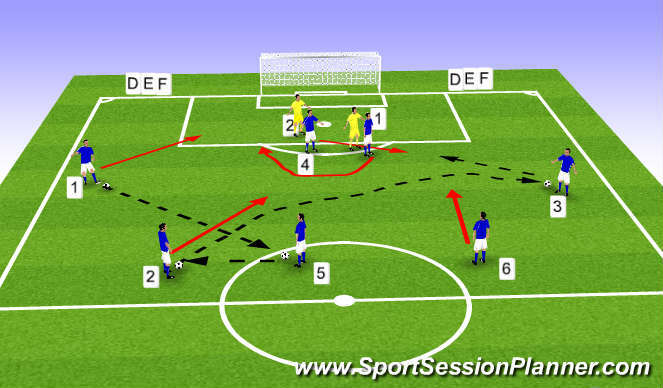 Striker 1 makes arch run away from ball & striker number 2 goes towards the ball to receive from FB. Whilst this is happening 6 makes a burst to take the lay off from Striker number 2 who can either shoot or play in number 1 or play in 2 who also gets forward. Note: 5 still sits in a holding role.